Post 129 third baseman Taylor Anderson throws to first after fielding a bunt in Tuesday’s game. Morgan Ryan scooped the ball at first for a bang, bang play and the runner was called out. It has been a rocky start for the Post 129 American Legion team of Hillsboro to kick off the summer season, on;y having won one game so far. Tuesday night was another tough loss for the team, as they couldn’t get the bats going and were defeated by Waverly 5-2. Morgan Ryan led the team at the plate going 2-for-3 with an RBI, driving Andrew Reuss home in the sixth inning for the team’s second run of the night. The first run came off the bat of Latrell Haithcock by way of sacrifice fly in the fifth inning scoring teammate Klay Walker. Joey Wilson drew two walks in the game as well. 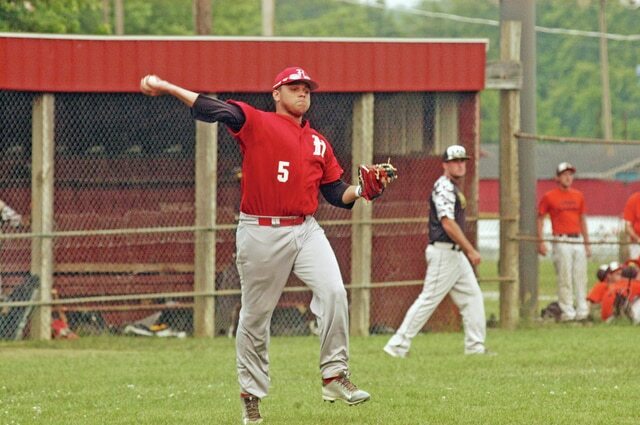 The Hillsboro team will be on the road for their next six appearances and won’t be back home until Friday, June 19 for the start of their Woodbat Tournament. The tournament will run Friday, Saturday, and Sunday.